Why is it that people worldwide would rather go to the dentist than have their car serviced? Thankfully at Toyotaservice.ie, we're changing all that, with 9 out of 10 customers saying they'd definitely recommend a Toyota Service to their friends and family. Whether you need a courtesy car, WiFi, or just a cup of tea, we’ll take the very best care of you and your Toyota. "They gave me an appointment when I contacted them at very short notice. They are professional, punctual, and so, so friendly. They always check if it's okay to proceed with repairs when they might be costly. They always offer me WiFi and hot chocolate- my favourite!! Once, they even dropped me to the swimming pool so I could swim while my car was being serviced." ..."I have been blown away with the level of customer service at my local dealership"
"As a first time buyer into the Toyota brand in 2016 I have been blown away with the level of customer service at my local dealership since the day I walked into the forecourt. Very courteous, helpful and diligent. Staff members that are always willing to go the extra (excuse the pun! ): phonecalls, lifts back home, quick service turnaround etc. Great value service. ..."the chocolates in the car when I returned were a lovely treat !" "I found the staff very helpful, polite and a pleasure to deal with. I was notified in advance how much the service was going to cost and when additional parts were needed I was contacted to confirm I was happy to proceed before they were fitted. The lady on the service desk kindly dropped me to work (5 minutes away) so didn't need to arrange a pick up. Also the chocolates in the car when I returned were a lovely treat !" I found the booking process very good compared to a local garage I had used before. To actually know the time to drop it in and to be told it would be done in less than 2 hours was impressive especially when I had to bring along my two kiddies, the garage were very mindful of that and rang me as soon as my car was ready for collection. "Very pleased with the professional but friendly attitude in this garage. Place is very nice. Zero effort getting a loan car for the time my car was being in service. Of course being a new car I had the luxury of not having to pay for the service, which pleased me too! Car was washed and valeted after service - major kudos right there! Organised when I arrived, no waiting, and organised when I returned, again no waiting. Excellent service!" ..."arranged to leave the car to my house"
"Customer service is excellent. Needed additional work that was not part of the car Service. Rang me to explain the problem before carrying out the work. Due to a personal circumstances couldn't pick the car up before closing so (they arranged) to leave the car to my house." ..."it’s the first garage that did the service so quick and cleaned my car!" "The service was excellent and the staff were very friendly, it’s the first garage that did the service so quick and cleaned my car! I also had tea and biscuits to keep me happy while i waited. All round a really good service." "I had arranged a service but on the day I had to bring my children with me as my wife was called into work at the last minute. In the ensuing panic I had forgotten my mobile phone. They made all the arrangements to have myself and my children dropped into the city centre and later collected. The service was carried out, evidence of the work done provided and a vehicle check done and car valeted." "Its the first time that I have ever gone to a main dealer for a service and I was very impressed by the whole experience. The staff were friendly, professional and polite. The work done was gone through with me in a detailed but not condescending manner, and the cost was not overly expensive." ..."organised for my car to be taken in the evening before"
"Because the team organising the service of my car were extremely helpful. They organised for my car to be taken in the evening before the service because I start work before the garage opened. This take a lot of stress out of organising services around work hours and prevents customers having to take annual leave days to have their car serviced." "one of the lads dropped him to his work place and collected him again"
"I gave the high score because my husband took the car for service on his way to work and one of the lads dropped him to his work place and collected him again that evening at an arranged time. The car was ready and all he had to do was pay and drive home." "I have only been driving for a year, and in that time have brought my Yaris to a few independent garages, to look at 2 noise issues. No problem was ever found, yet the noises remained and got worse. Within 5 minutes of talking to a Toyota specialist the issue was identified. It was a 3rd party exhaust that was a little too big for the body. The whole experience as well as how the car looked and felt after its service was amazing. The staff at the Toyota dealership in Sligo were brilliant. I will only return to them in future as I now have total confidence in their care of the car." "Friendly, efficient and helpful staff. The service was carried out on time and my car was returned to me having been washed and vacuumed inside. I was provided with a comfortable place to sit and wait for my car with newspapers, magazines and a television to entertain me, and a very kind member of staff even brought me a mug of hot chocolate while I waited." "Very efficient and family oriented service provider." "Myself and my wife work opposites so timing a time for a service can be difficult due to needing car seats in car. They were very accommodating and dropped and collected myself from work in order to work around childcare. Very efficient and family oriented service provider." "My car was in excellent condition when I go it back, a mini valet was included in my service, the inside was spotless and the outside was shining. There was even two chocolates left inside my car for me. I thought this was a lovely touch." "The service is exemplary and the team in Wexford have always delivered a great service and experience. Always a personal touch and I feel like they really care about ensuring quality. My Auris is nearly 10 years old and has done over 400,000km's yet it has never let me down. It is critical to me for travelling to and from work and does over 1000kms ever week. Therefore I rely on the servicing team to keep the car reliable and safe. I trust Toyota as a brand and the team as top class service providers - friendly, reliable and most importantly, they keep my car going and going. A huge thank you!!" ..."all of the staff have looked after me extremely well no matter how trivial my concerns might be. " "I've been a customer for the last 11 years; all of the staff have looked after me extremely well no matter how trivial my concerns might be. They are always cheerful and courteous to all of their customers." "I would highly recommend your Toyota Dealer /Authorised Repairer to any of my family,friends and also colleagues .The whole visit was very well and could not be any happier with the service and the staff were wonderful help for the whole day .Thanks"
"You are greeted so well and they make you feel very important. They give you access to a courtesy car. When I came in to collect my car it was polished to the highest and my alloy rims were shining. Lovely people and tea/coffee/newspapers at your disposal with cookies/biscuits." "Very good service, excellent. They were very helpful and there was no problem at all in letting me have a replacement vehicle. The chap who carried out the works did a superb job, sorry I can't remember his name. Excellent all round. They rang us 2 days later to see how we were getting on with our jeep which I thought was really nice and excellent customer service." The car was returned to me in spotless condition, washed and hoovered. A nail was removed from the front tyre which I was unaware of and the puncture repaired. I was treated with the utmost respect and courtesy at the front desk. "Staff in all areas are always so very pleasant and incredibly helpful. No query is ever too small for them to give an informative and explanatory answer, I am always greeted there as if it was my first visit again." "Haven't had my car serviced in the dealership before. They spent time explaining what they had done and answered any questions I had. Found him very helpful and efficient. My experience was excellent from start to finish. Will definitely go back for my next service." "Rang at 9am looking to book car in for a service and was accommodated with a time for 10:30am and got a car to travel home while my car was being serviced. Top class." ...That to me is service." "They given you an appointment, when you get there you are seen straight away. Your keys are taking and you are asked if you want a lift into town or city and collected when your car is ready. That to me is service." ...Very assured the car was in expert hands." "Excellent service. Car looked great after service and every query/ question we had answered. Very assured the car was in expert hands." ..."since dealing with Toyota I would not change to any other make." "I have always found the staff most courteous and helpful as I am disabled they go beyond what one would expect from a business concern. In my lifetime I have had many different makes of car and since dealing with Toyota I would not change to any other make." ..."Box of chocolates offered after service (nice!) Very friendly staff"
"Nice waiting area with newspapers. I was offered tea or coffee, service began on time, service was completed promptly. Box of chocolates offered after service (nice!) Very friendly staff"
..."I am with the same dealer since 2012 and don't intend to change"
"I was looked after very well, offered tea or coffee while I waited. I was even asked if I wanted to be dropped to town and collected whilst I was waiting I am with the same dealer since 2012 and don't intend to change"
"My car was serviced perfectly. I was sent a video from the mechanic which showed they took time to check over the car. And when I got my car back it had been washed and cleaned inside." "Great customer service - on time and on budget. No problem dropping me home and collecting me after. Staff couldn't do enough for me. A bonus was stepping into a nice clean car too!" ...the ease of making an appointment and the thoroughness of work done!!" "Because of the friendly reception, the fact that I get a Txt reminder that service is due, the ease of making an appointment and the thoroughness of work done!!" "Excellent service 1. Appointment made for me by staff member in gargage. 2.Lift to work organised. 3.Collected car serviced & washed & valeted after work. *Very Impressed*"
"As a brand new customer I was made feel 100% welcome and service very quick, appointment suited perfectly." "The staff are very helpful outside the servicing. They connected my phone and answered my queries about the general operation of my car." "Because I clearly love driving my new Corolla, I clocked up over the 15,000km in 6 months, brought it in for it's service & headed off down town to pass away the time. Only gone 5 mins & they called me offering a lift as it was slightly raining, I mean come on where would you get that personal care like that these days?" ..."all good reasons to recommend to my friends." "My visit to my local Toyota Dealer was exactly what I needed. Great staff, excellent service. Friendly atmosphere all good reasons to recommend to my friends." "Excellent service & so efficient, totally helpful & so friendly, I would recommend this garage to anyone, highly impressed with it as we are on our first Toyota, we will be back." ...no hesitation it recommending to family or work colleagues or friends." 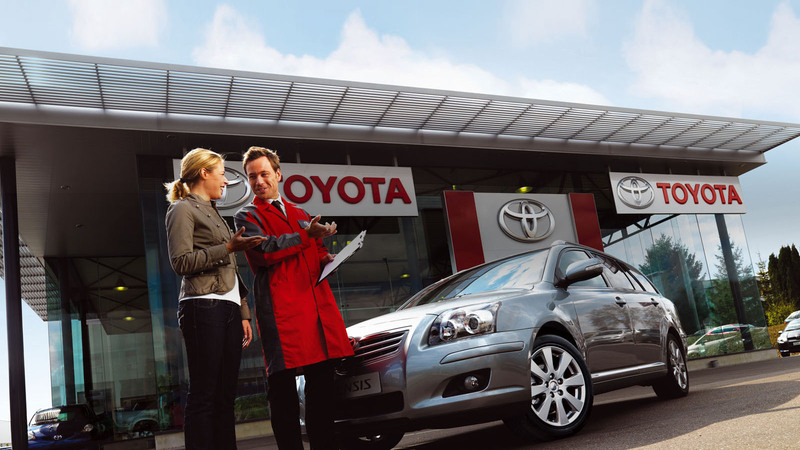 "Found the staff at my Toyota Dealer, friendly and professional with a high level of customer care. Would have no hesitation it recommending to family or work colleagues or friends." ...you just know that they have looked after it so well." "Because they are brilliant. They give you a car if it is needed. They tell you when your car is ready and they wash it and when you collect it it looks brand new and you just know that they have looked after it so well." "The whole experience is very professional, from when you make the initial booking to the follow up phone call after your service. Service appointments are very quick- no waiting you could have a service in 24 hours in most cases. *Just one more thing, I love the way the car is returned to you all washed , and whatever product is used to wash it stays clean for ages, and looks so well for ages afterwards. Very good." "Absolute excellent customer service from dropping my keys in to collecting the car at the appointed time. A follow up call from the garage a few days later shows a real commitment from the dealer to its customers. I have been recommending them since purchasing the car in 2016." "Firstly it was literally a door to door service and secondly I am more confident in the car due to the service which it recieved in your garage. I will definitly be a return customer to your garage and have already advised family members of your service quailities." ..."Decided to buy Toyota last year because of their customer service. 100%"
"Always a pleasure to get my car service in thsi dealership. Staff always helpful and pleasant. Decided to buy Toyota last year because of their customer service. 100%"
..."will return for my next service to them delighted with all the advice given." "My car was serviced very promptly and they even rang me to let me know I needed new brake pads before they fitted them. All staff were extremely helpful and asked was there any issues I need looking at great value too and they washed my car after service was done. im very happy with my experience and will return for my next service to them delighted with all the advice given." - Yaris Driver, Co. Waterford. The quotes above were provided by customers when surveyed about their experience after getting their vehicle serviced. In circumstances where personally identifable information was given, this has been removed from the quote and spelling errors corrected if necessary to improve the readability of the quote.